A young Cuvier’s beaked whale was found washed up in the Philippines Friday, weak and vomiting blood. 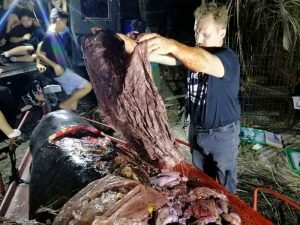 When he performed the necropsy, marine biologist Darrell Blatchley wasnt surprised to learn the whale’s killer was plastic. It is the usual suspect these days. But he was surprised by how densely packed the plastic was… so much so that there wasn’t room for any food in the whale’s stomach. The majority of the 88 pounds of plastic he found was plastic bags including shopping bags (from grocery chains in the Philippines), rice sacks and banana plantation sacks. Of the 9 million tons of plastic tha end up in the ocean each year, more than half comes from just five countries — China, Indonesia, the Philippines, Thailand and Vietnam.